A supernova discovered yesterday is closer to Earth—approximately 21 million light-years away—than any other of its kind in a generation. 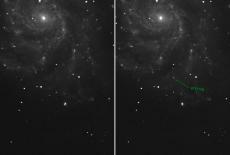 Astronomers believe they caught the supernova within hours of its explosion, a rare feat made possible by a specialized survey telescope and state-of-the-art computational tools. The discovery of such a supernova so early and so close has energized the astronomical community as they are scrambling to observe it with as many telescopes as possible, including the Hubble Space Telescope. Joshua Bloom, assistant professor of astronomy at the University of California, Berkeley, called it “the supernova of a generation.” Astronomers at Lawrence Berkeley National Laboratory (Berkeley Lab) and UC Berkeley, who made the discovery predict that it will be a target for research for the next decade, making it one of the most-studied supernova in history. The supernova, dubbed PTF 11kly, occurred in the Pinwheel Galaxy, located in the “Big Dipper,” otherwise known as the Ursa Major constellation. It was discovered by the Palomar Transient Factory (PTF) survey, which is designed to observe and uncover astronomical events as they happen.